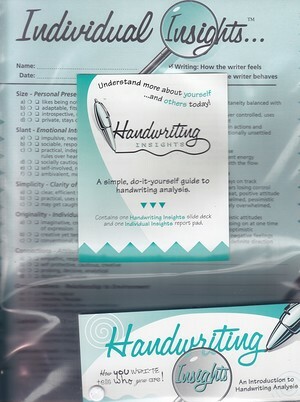 Handwriting analysis is a fun, time-honored method of determining personality traits. Regardless of whether you take it seriously, it's a great ice-breaker when you're getting to know somebody. People always enjoy learning what their writing styles say about their personalities, emotions, energy levels, etc. If you've ever wanted to give it a try, this is a quick, easy, ingenious system. Start by taking a handwriting sample--yours or someone else's. Next, open the slide deck of cards that list examples of various handwriting characteristics, such as size, slant, simplicity, originality, zone emphasis, and the baseline. Choose the examples that come closest to your sample for each characteristic. The personality traits demonstrated by the examples are printed on the back of each card. Now, simply check the choices on one of the printed "Individual Insights" sheets. The slide deck consists of 63 sturdy, laminated, attractively illustrated cards, connected at the corner so that they open into a wheel shape. This makes the comparisons easy to spot and to organize. The "Individual Insights" sheets, which come on a pad, follow the same order; by checking the appropriate boxes you will compile a wide-ranging personality profile.